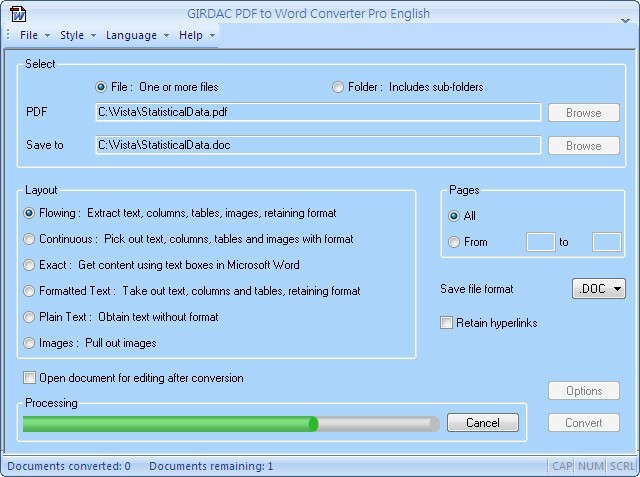 GIRDAC PDF to Word Converter Pro is an enterprise application for converting PDF documents to Microsoft Word .DOC, and .RTF file formats, and plain text file. It can also extract images from PDF documents. (c) Exact: Converts PDF documents by making several segments same as text boxes Microsoft Word. (d) Formatted text: Converts PDF documents retaining the format and text, discarding images. (e) Plain text: Converts PDF documents by extracting text without format. (f) Images: Converts PDF documents by picking images only. It retains PDF document hyperlinks in the converted DOC or RTF document. It converts PDF documents to .RTF and .TXT formats without Microsoft Word and Adobe Reader installed. It supports partial PDF conversion with selected page range. Qweas is providing links to PDF to Word Converter Pro 2.0 as a courtesy, and makes no representations regarding PDF to Word Converter Pro or any other applications or any information related thereto. Any questions, complaints or claims regarding this application PDF to Word Converter Pro 2.0 must be directed to the appropriate software vendor. You may click the publisher link of PDF to Word Converter Pro on the top of this page to get more details about the vendor.